ROAD TOWN, Tortola, VI- Scotiabank (BVI) Limited in collaboration with the British Virgin Islands Health Services Authority will host the second annual 5K Walk/Run on November 7, 2015 to benefit the Peebles Hospital Pediatric Unit. 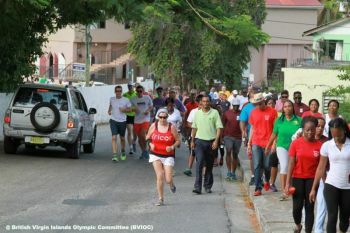 Last year Scotiabank (BVI) Limited pledged to donate $15,000 annually over three years, totaling $45,000, and will co-host several local fundraising initiatives to help generate additional funds to aid the Pediatric Unit. The registration cost is $25.00 for adults and children under 12 years of age are free. The first 100 persons to register will receive prizes complement of Scotiabank and other corporate sponsors. Persons can register as an individual or as a group. Registration forms will be available at every Scotiabank branch, at Peebles Hospital, at all Community Health Clinics and can be downloaded at www.bvihsa.vg. Interested persons are kindly asked to contact Olanzo Boynes at 541-1446 / 852-2188 or Franka Potter 541-1602. Pediatric services available through the British Virgin Islands Health Services Authority are administered by certified pediatricians who diagnose and treat medical conditions of patients from birth to 16 years of age. The British Virgin Islands Health Services Authority is dedicated to serving the health care needs of all patients.